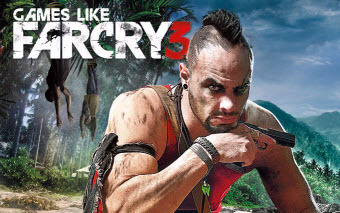 20 FPS Games Like Far Cry 3 '+g+"
Far Cry 3 is an open world first-person shooter game published by Ubisoft. It's the third installment in the series set on a hostile tropical island where the player step into the shoes of Jason Brody who has to rescue his friends from pirates, slave traffickers, and deadly animal predators. If you are a fan of action-adventure RPG games like Far Cry 3 and looking for more games with similar gameplay then find the recommendations for it below. Obviously, it goes without saying that the games most like Far Cry 3 are the prequels, so I am not including them in the list so try them if you haven’t already and don't forget to mention if we miss any games as we keep on updating this list. Dead Island: Riptide is an survival horror action role-playing game developed by Techland and published by Deep Silver. It is the second installment in the Dead Island franchise where the survivors Crash-land into another zombie-infested tropical island, the nightmare starts all over again leaving hope drowning in the rising tides. Tomb Raider is an action-adventure video game developed by Crystal Dynamics and published by Square Enix. It is a full reboot of the Tomb Raider franchise, that emphasises the origin of Lara Croft from an young and inexperienced woman to a hardened survivor. The gameplay combines a mix of puzzle solving, platforming and combat in an open world environment. Red Dead Redemption is an western-themed spiritual successor to Red Dead Revolver by Rockstar Games. Set in 1911 American Wild West the player step into the shoes of John Marston, a former outlaw who is forced by the government to kill or capture his former gang members by keeping his wife and son as hostages. Uncharted 3,......if you can think of more, then don't forget to mention it in comments.